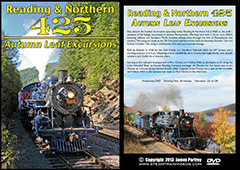 See Reading & Northern 4-6-2 #425 like never before: running solo on the steep grades of the R&N mainline. This is easily the most thrilling #425 video yet, with full coverage of 3 days of solo runs during the 2016 season, including the first ever Autumn Leaf Excursion operated without a diesel helper. 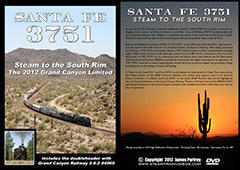 This program begins with the first trip of the year: a two-day photo charter in mid-February, which featured #425 on the point of a 4-car passenger train with an authentic Reading 6-chime whistle. 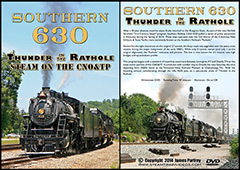 Operating amidst falling snow and bitterly cold temperatures, the special ran from Port Clinton to Jim Thorpe and then north into the Lehigh Gorge - with great runby action at a number of rare locations. We'll then skip ahead to the last trips of the year, as #425 pulled two days of Autumn Leaf Excursions in October. 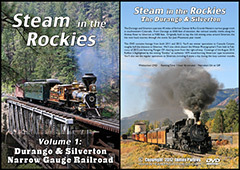 Operating between Port Clinton and Jim Thorpe, these are the most popular trips the railroad offers and they always run with diesel assistance because of the length of the train. On Saturday the 15th, #425 pulled the usual 14-car train with an SD40-2 diesel helper (the only trip with a diesel in this video). 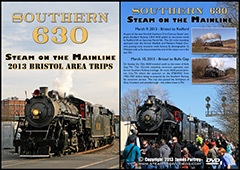 Sunday was the big event, as #425 pulled 8-cars solo for the first time on one of these excursions. 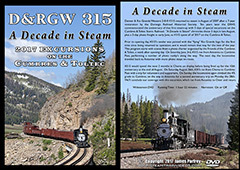 We'll chronicle this historic trip with extensive in-cab views as the little Pacific struggles mightily on the grade north of Tamaqua. Almost half this video is dedicated to this one incredible excursion. 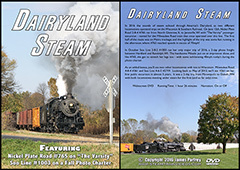 Filmed entirely in HD, this program features impressive steam action and beautiful eastern scenery. There is minimal narration (with the option to turn it on or off) and no distracting music. 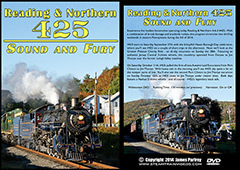 Once again, we return to Eastern Pennsylvania to experience the loudest locomotive operating today: Reading & Northern 4-6-2 #425. 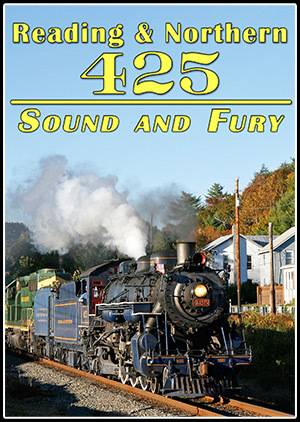 With a combination of in-cab footage and trackside runbys, 'Sound and Fury' chronicles 2 weekends of excursions during the fall of 2014. 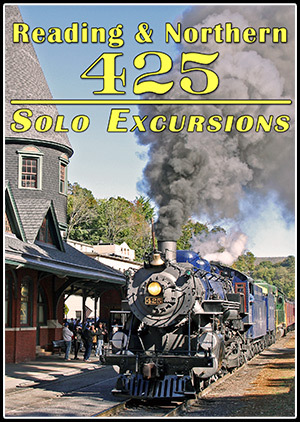 This program starts on Saturday September 27th as #425 pulls a few short trips during the Schuylkill Haven Borough Day celebration. The next morning you'll see her in Duryea, getting ready to pull the 'Greater Pittston Charity Ride' over the mountain to Jim Thorpe. Operating over the former Lehigh Valley mainline, #425's booming exhaust sounds great at speed - complemented by a sweet sounding Jersey Central 3-chime whistle. With a camera mounted in the cab, you'll see the engineer at work on the climb to Solomon's Gap in the morning, plus a number of hard-working runbys in the afternoon. 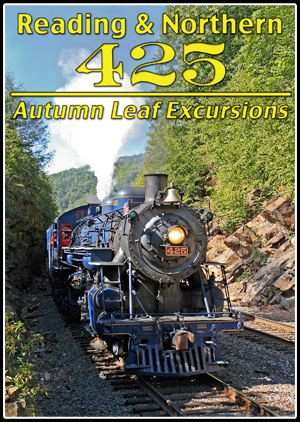 On Saturday October 11th, #425 pulled the first of two Autumn Leaf Excursions from Port Clinton to Jim Thorpe. We'll cover these trips in detail, with a handful of new runby locations along with many of the classics. With heavy rain Saturday morning, you'll see #425 struggle mightily on the steeper parts of line. The next day, #425 ran the same trip with much better weather. 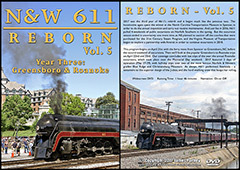 We'll again combine trackside runbys with in-cab footage, this time on both the fast morning run to Jim Thorpe, and the impressive afternoon assault on Hometown Hill. 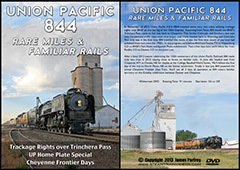 Both days feature a Nathan 5-chime whistle - and of course - #425’s legendary stack talk. 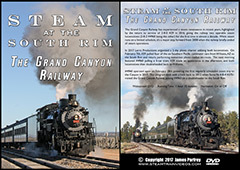 Filmed entirely in HD, this program features great steam action and beautiful fall colors. There is minimal narration (with the option to turn it on or off) and no distracting music. 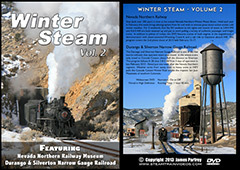 Step aboard the loudest locomotive operating today: Reading & Northern 4-6-2 #425. After sitting cold for almost 3 years, #425 returned to service in 2013. 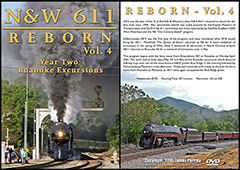 In October she was once again on the head end of the railroad's annual Autumn Leaf Excursions between Port Clinton and Jim Thorpe. 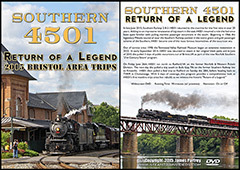 This program covers the Saturday October 12th and Sunday October 13th trips as #425 pulls a 15-car passenger train. 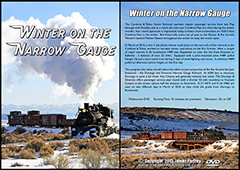 Footage from both days is combined with in-cab views to offer a unique perspective on these trips. 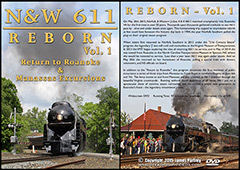 In the morning, you'll step inside the cab at Port Clinton for the northbound trip. 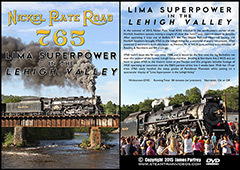 Once underway, #425 races along the Little Schuylkill River towards Tamaqua on ex-Reading Company rails. At Haucks the line turns east following a former Jersey Central branch to Jim Thorpe. 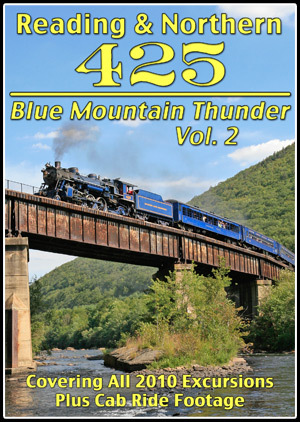 After letting passengers off in Jim Thorpe, #425 takes a spin on the turntable. You'll see her being turned and serviced before heading up the line to Nesquehoning to take water. 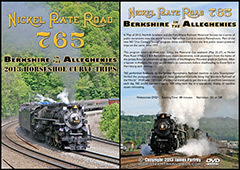 After returning to Jim Thorpe, we'll follow the train back to Port Clinton in the afternoon. The highlight of the return trip is the climb of Hometown Hill, with #425 on her knees battling the grade. 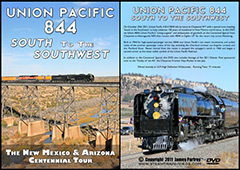 Both trips feature a Southern Pacific 6-chime whistle and some incredible stack talk. One of the hardest working locomotives operating today, #425 puts on a spectacular show thundering through Pennsylvania coal country. 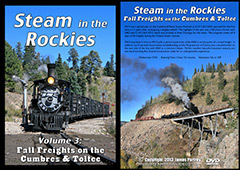 Filmed entirely in HD, this DVD features great steam action and beautiful fall colors. This program has minimal narration (with the option to turn it on or off) and no distracting music. 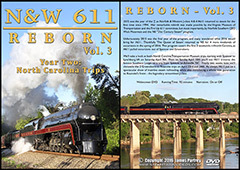 Filmed entirely in High Definition, this DVD continues where Volume 1 left off - this time chronicling the 2010 excursion season. 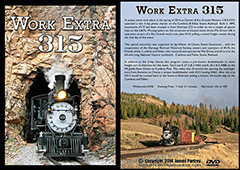 In addition to our usual exhilarating trackside footage, this program also features in-cab footage from multiple cameras on one of the October fall foliage excursions. Also included is the finale to the 2010 NRHS Convention (held in Scranton, PA), where #425 put on a spectacular show for convention goers. 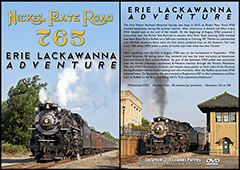 This excursion covered a large portion of the R&N system, with a unique routing from Duryea to Jim Thorpe, and then on to Port Clinton. 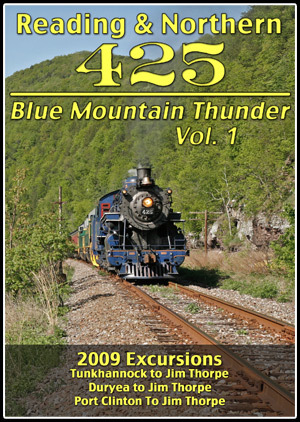 As an added bonus, this disc has footage of #425 pulling excursions on the Lehigh Gorge Scenic Railway in Jim Thorpe, PA without any diesel assistance. The annual United Way Excursion in May is also covered, in addition to all 3 fall foliage trips in October. 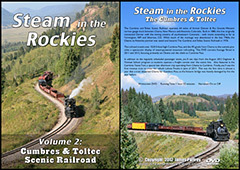 Once again, great stack talk, a variety of different whistles, and beautiful scenery make this DVD a must have for any fan of steam railroading. 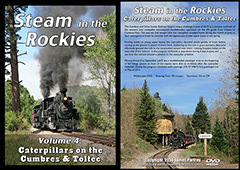 There is no distracting music or narration on this DVD; just well-filmed and well-edited clips of one the loudest and hardest working steam locomotives today. 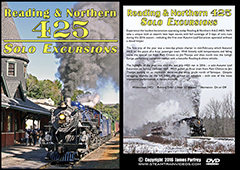 After many years without active steam power, the Reading & Northern Railroad (formerly the Blue Mountain and Reading) made the decision to restore former Gulf, Mobile, and Northern light Pacific #425 to operation, for passenger service on their extensive trackage in Eastern Pennsylvania. 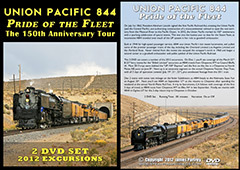 This DVD chronicles the second excursion season in 2009, with coverage of all the major trips. 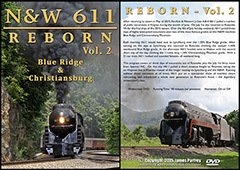 You'll see this gutsy blue Pacific as she battles the grades of the former Lehigh Valley mainline, travels ex-Reading Company trackage through the heart of anthracite coal country, and operates on former Central Railroad of New Jersey tracks - all now owned by the Reading & Northern. In addition to beautiful fall foliage, you'll see #425 in a rare early autumn snowstorm. With plenty of great stack talk, a variety of different whistles, and beautiful scenery, this program has something for every viewer. 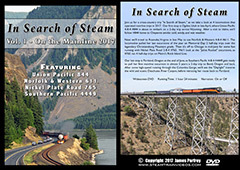 #425 sounds like a locomotive twice her size, as she puts on an incredible show of steam powered railroading. 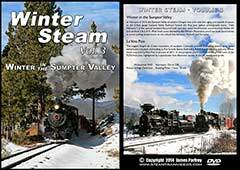 This DVD also includes the October 18th, 2008 trip from Port Clinton to Jim Thorpe, as #425 struggles mightily to keep the power to the rails. 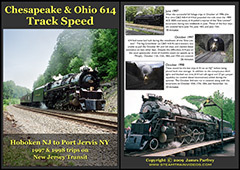 This segment features lots of wheel slipping as #425's crew deals with wet rail, and an especially long train, on the climb from Port Clinton to the ex-CNJ part of the line at Haucks. 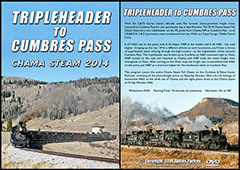 There is no distracting music or narration on this DVD; just well-filmed and well-edited clips of one the loudest and hardest working steam locomotives in the country today.